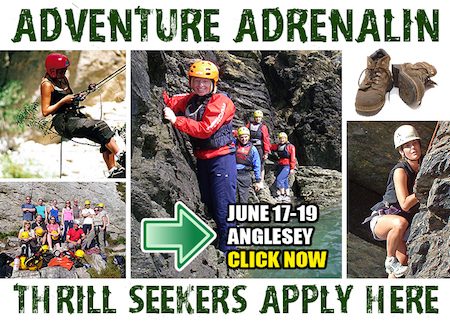 All inclusive 3 day fantastic outdoor adventure weekend with exciting activities ranging from Coasteering, Abseiling, Climbing all set in the stunning surroundings of Angleseys spectacular coastline. IF YOU LOVE ADVENTURE THIS IS FOR YOU. ALL INCLUSIVE OUTDOOR WEEKEND 17th - 19th June BOOK NOW AND SECURE YOUR PLACE. All inclusive 3 day fantastic outdoor adventure weekend with exciting activities ranging from Coasteering, Abseiling, Climbing all set in the stunning surroundings of Angleseys spectacular coastline. Dont worry if you have never tried them before as no experience is necessary. The Package: For an amazing £155 you get: 3 days, 2 nights All Inclusive Outdoor Weekend 17th to 19th June with self contained en-suite accommodation. All food provided with cooked breakfasts, packed lunches and home cooked evening meals. All activities are with a fully qualified instructor so no outdoor experience needed. We supply all the necessary technical equipment so all you need to bring with you is plenty of enthusiasm. The open coal fire or our hot choc with brandy will help you feel right at home! Accomodation: A light, spacious and airy hideaway! It sits in large gardens in a truly beautiful secluded spot overlooking the village and Bay.Maes y Bryn sits amongst the gorse and rocks overlooking the bustling resort of Trearddur Bay.It offers discerning guests a little piece of tranquillity just a few minutes walk from the main beach and village. Friday Arrival dinner: 8pm approx with a weekend briefing from Steve your guide/instructor/tutor. We'll have a bite to eat and then go for a few drinks at the local pub for a chance to get to know each other better and discuss the weekend adventure ahead. Coasteering is the nearest you can get to being a seal. Kit up with a wetsuit, buoyancy aid and helmet, and do everything your mum told you not to: climb, scramble and swim around the rocks and into hidden caves, pausing occasionally to throw yourself off a cliff into the swirling waves below. It can be as peaceful or extreme as you could want and its incredible FUN! We will provide you with a, kagoul, buoyancy aid and helmet. Anglesey is fast becoming the Mecca for Coasteering and adventure seekers! Try a half day climbing and abseiling on the lower crags of Holyhead mountain. We can set you easy to more challenging graded climbs depending upon your ability and experience. After the climb you may wish to try an abseil which should prove to be a breath taking experience - views can be magnificent! Our qualified instructors will set up and the routes then show you what it's all about and give you full safety instruction to allow you to climb at your own pace. Saturday night we sit down for our freshly prepared home cooked meal accompanied with a glass or two of wine and in true Social Circle spirit enjoy laughs aplenty with evening entertainment! After a lazy start reading the Sunday papers we will have our gentle 5 mile walk up the coastline viewing some of the great beaches and might even see a seal or two. Weekends away are great social occasions and are always more fun as part of a group. It's a great way to meet new people so don't worry if you are coming on your own. We will be car sharing up and down so lifts won't be a problem if needed.